Just one week after the Geneva Agreement on Iran’s nuclear program, major carmakers and parts suppliers have shown up in Tehran to assess the Iranian market's potential. The International Conference of the Automotive Industry, the first such event in Iran, has brought together more than 150 companies from around the globe. The conference opened on Saturday in Tehran. The industry has been battered for more than a year by sanctions. Prior to the most severe sanctions imposed on Iran in 2011, the country had the 11th-largest car market in the world and was the 13th-largest car producer. The sanction exposed the soft belly of the Iranian automobile industry - a sobering experience for many Iranians when they realized that all that talk about the ‘indigenous (boomi) automobile industry’ was just hot air. I hope they have learned their lessons, and this time aim for a better joint venture involving real transfer of technology and know-how. The current peugeot/renault ventures are like opium to the Iranian motor industry which get them addicted in buying the end-of-life models in kit form that no one in the developed world would buy. "the europeans have shown just how untrustworthy they were"
So it took you your whole life to figure this out? What a genius! West, east, black, white, oriental, etc. are in the game for their own personal gains and couldn't give a hoot about Iranian people. Only Iranians can defend the rights of our nations but I am afraid such individuals that will put their NATION before their own greed are to put it politely non existent in the IRI government. ONE of the most noble gifts any establishment can give to its people is -offering the environment for the people to trust their own skills .It is for this reason that i can't buy your argument that ,the initiative to realize an indigenous automobile industry 'was hot air'. I do agree however that the sanctions exposed the soft belly of the Iranian automobile just as it is true lessons were learned.However the truth is that Iran is currently at a point where the Arabs kingdoms will only dream for decades to come despite having asses to western technology and market. With the Donkey [US]-showing some real zeal to toss the self inflicted burden of sanction [that threatens to break its back] ,We are looking forward to seeing a robust economy in the middle east in a span of a few years ,thanks to these noble initiatives by the establishment !. Iran needs a lot of things but it won't get them so long as aterrorist mafia regime runs the country. It also exposed what a bunch of bull shitters the regime are when they said that Iran is,"independent". you was never im irqan ? 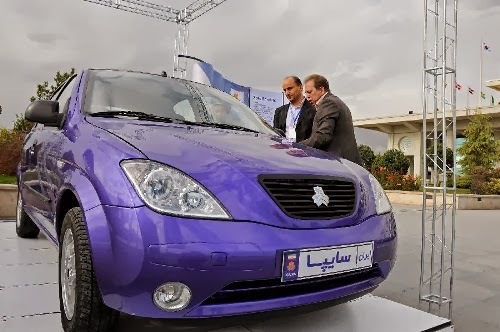 under heavy sanction the irqan was able to produce own designed car, as you see the Saipa-Tipa in picture above. however the demand is too large that without import and foreign car maker can be fullfilled.